Is virtual reality’s potential even three times bigger than we expect? New research into how you censor yourself online… the problem with paying by fingerprint… why we’re not (too) alarmed by the latest bail-in news… and more! 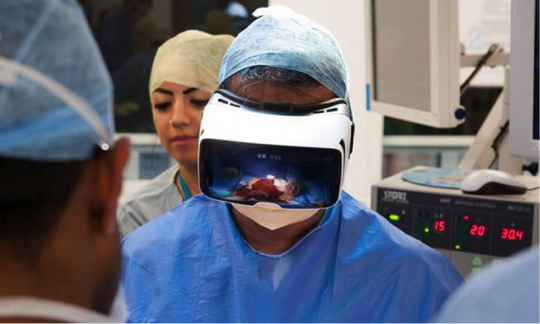 As we sit down to write this morning, the world’s first virtual-reality surgery is underway in London. Sure, videos of surgery have been around for years. Two years ago, Ahmed himself performed an operation via live webcast wearing Google Glass. Three or five more years down the road, “haptic” devices will create an even more “real” virtual experience. “Companies are really working on various gloves or bodysuits and devices so that it can replicate touch and feel,” he says. Meanwhile, “response so far has been really amazing,” says Facebook CEO Mark Zuckerberg of his firm’s Oculus Rift VR headset. Exactly what he meant by that, he didn’t say. But as we noted here on Tuesday, the wait list is loooong. A few lucky people who ordered the morning of Jan. 6 — when pre-orders were opened up — have received their Rifts by now. But not us here at Agora Financial: The one we ordered around noon that day won’t ship until late June. Reports the techy site CNET, “Zuckerberg clearly has designs for Oculus to compete with devices like Microsoft’s HoloLens, the next evolution of Google Glass and whatever comes out of the well-funded startup Magic Leap. Not bad for what Business Insider said early last year was only a $37 million business. Even a more conservative projection of a $30 billion business by 2020 amounts to 81,000% growth. But as our science-and-wealth maven Ray Blanco keeps reminding us, the way to profit is not via Facebook or Microsoft or Google. Their VR efforts are common knowledge. If you really want to maximize the profit potential, you have to go in through the back door. Ray shows you the way when you click here. The major U.S. stock indexes are taking a breather after hitting their 2016 highs yesterday. The S&P 500 is off fractionally at 2,080 — 50 points off its all-time high nearly a year ago. The financials are likewise flat after two more megabanks reported their quarterly numbers. Profits are down at both Bank of America and Wells Fargo. Yesterday, JPMorgan Chase said the same thing, but that was cause for a rally in financials. Go figure. Gold’s two-steps-forward-one-step-back action continues: After cresting $1,250 on Monday, it’s back at last check to $1,232. Crude is flat at $41.74. Any possibility of the Federal Reserve raising interest rates later this month got squashed this morning by the latest inflation numbers. The consumer price index registered a 0.1% increase during March. The year-over-year CPI increase works out to 0.9%, and that’s down from 1.0% the month before. The “core” rate excluding food and energy also fell from 2.3% to 2.2%. In other words, inflation is moving in the wrong direction from the Fed’s perspective. Also slowing is the real-world inflation rate from Shadow Government Statistics, which measures CPI the way it was measured before the wonks started monkeying with the numbers during the Reagan administration. It registers a year-over-year increase of 8.5%, the lowest since December. The old line about “Don’t fight the Fed” is no longer relevant, says our income specialist Zach Scheidt. “The phrase is supposed to remind investors to pay attention to the Fed’s interest rate decisions and to avoid betting against the Fed’s policy moves,” he says. Zach’s favorite “nontraditional weapon” involves precious metals. “A weaker dollar naturally results in stronger gold prices.” But the weapon Zach has in mind is one that generates income. Two days ago, his premium subscribers had the chance to “make the Fed pay” and collect an instant $270 payout using Zach’s perpetual income system — explained here by our publisher Joe Schriefer. 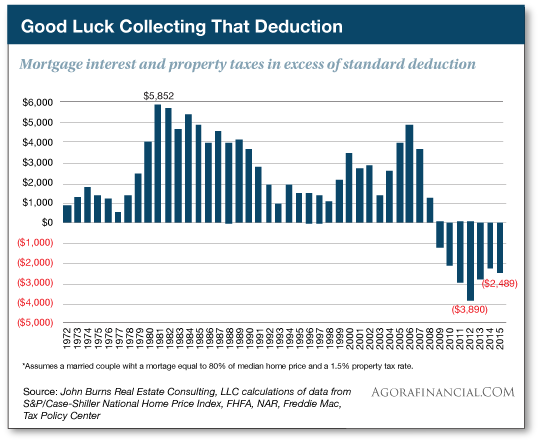 Here’s one more thing ultra-low interest rates have wrought: More and more homeowners are unable to itemize their income tax deductions. Here’s Burns’ proof: The following chart shows how much a typical homeowner couple pays over and above the standard deduction — assuming a median-priced American home with an 80% loan-to-value mortgage and a 1.5% property tax rate. Funny, we recall David Walker — the former U.S. comptroller general and protagonist of Agora Financial’s 2008 documentary I.O.U.S.A — describing how it was possible to climb out of the national debt abyss. “If we can fix just two things,” he said, “we can get out of this mess. But we can’t have an honest conversation about it.” Those two things were the cost of end-of-life health care… and the home mortgage interest deduction. Whaddya know? Seven-plus years of nutty Fed policy and one of those problems is close to being solved! Here’s an intriguing new wrinkle in the phenomenon of people who censor themselves online. Now comes a new study in Journalism & Mass Communication Quarterly, surveying 255 people representing America’s broad demographic mix. They were asked to comment on a fictional Facebook post about a U.S. decision to continue airstrikes against ISIS. Then they were asked how they felt about government surveillance. Those who felt their opinions were in the minority were less likely to speak up about the article. And that was the case no matter whether they supported or opposed government surveillance. “The fact that the ‘nothing to hide’ individuals experience a significant chilling effect speaks to how online privacy is much bigger than the mere lawfulness of one’s actions,” says Wayne State University’s Elizabeth Stoycheff, the study’s author. “I was purchasing a used patrol vehicle through North Carolina’s State Surplus Property Agency for just under $7,000,” writes a reader with a frontline report from the war on cash. “Hmmm,” a reader muses about Japan’s pay-by-fingerprint scheme for foreign tourists… “This measure might indeed reduce theft of tourist cash and credit cards, which would, of course, be good. The 5: Fingerprint “authentication” is a joke. Hackers have already figured out how to snag a fingerprint from a photograph merely showing the palm of someone’s hand. From there, it’s probably not much of a leap to snagging your print off a coffee mug and making a copy that can fool the scanners. And what if hackers get into a centralized database that contains thousands or millions of prints? At least you can change a password or PIN, even if you can’t remember it half the time. “The pay-by-fingerprint experiment may be doomed to failure for two reasons — an aging population and ‘fingerprint fatigue,’” another reader writes. “When I moved to a new state after retirement, I applied for a concealed weapons permit. About a month into the process, the sheriff’s office notified me I needed to be reprinted because the first set were not readable. Chatting with the fingerprint tech who took the second set of prints, I learned that this happens ‘a lot’ with senior citizens because your fingerprints literally wear away over the course of a lifetime of work, chemical exposure, injury and lack of skin oil. “Instead of replacing the beloved Hamilton on the $10 bill,” a reader writes after yesterday’s episode, “why not invent two new bills — $200 and $500 — on which to place the ladies? “After all, if it is inflation our lady Yellen is looking for, we will certainly need larger denominations as that kicks in. In the past, there have been five larger denominations: $500, $1,000, $5,000, and $10,000 were printed for general use (in large transactions), and a $100,000 bill for certain internal transactions. Bring ’em back a little at a time and give the ladies their due. The 5: Yeah, we saw the scare headlines. This one, however, we’re not too excited about. True, it’s the first bail-in since all European Union member states were required to have bail-in legislation on the books at the start of 2016. But importantly, individual depositors won’t be affected with this one. Instead, the creditors will take a bath — which is how it’s supposed to work, and did in most places until 30-some years ago. P.S. Ex-CIA officer Jason Hanson carries a covert self-defense tool with him wherever he goes. It’s not a gun or pepper spray. And no, it’s not a knife, either. But this thing is higher-tech than it looks. And it could save your life one day.